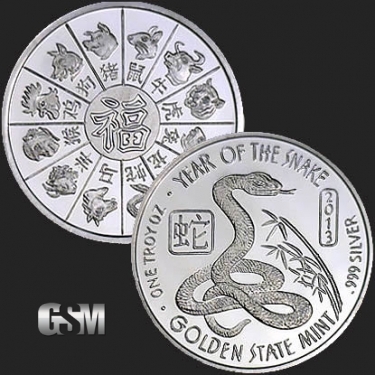 To celebrate the Year of the Snake, Golden State Mint is offering this beautifully designed 1 Oz of .999 Silver round for our Chinese Zodiac Collection. The Year of the Snake, which is part of the Chinese Zodiac 12-year cycle, was last celebrated in 2013, and will see its next year in 2025. 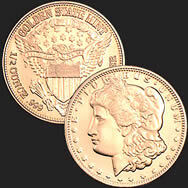 This mint-fresh bullion is designed with the utmost care and attention to detail, adding value to any collection or portfolio. This attractive round captures your attention with its design on the obverse (front face) with a finely detailed snake coiled amidst a bamboo forest. The Chinese character for “snake” is set next to its namesake. 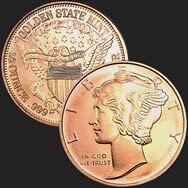 On the top of the silver round it is inscribed with “Year of the Snake”, while “Golden State Mint” is displayed on the bottom. 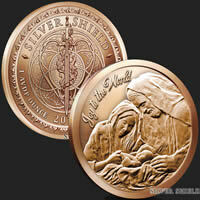 The round is also labeled with the year “2013”, a purity of “.999 Silver” and the size “One Troy Oz”. The reverse sign of this silver round is just as interesting, with the twelve animals of the Chinese Zodiac and their respective Chinese character. The animals shown consist of the rat, ox, tiger, rabbit, dragon, snake, horse, goat, monkey, rooster, dog, and pig. In Chinese culture, the Snake is known for being intelligent and wise, and owning this attractive piece is a testament to your own intelligence and wisdom. If you liked this product, you should check out our 1 oz Copper Year of the Snake, 1 oz Silver Year of the Monkey, and 1 oz Gold Year of the Rooster.